Apple cider vinegar ear drops are used by some naturopathic vets to treat bacterial ear infections. Unpasteurized apple cider vinegar (ACV) is acidic, and bacteria don't thrive in acidic environments. 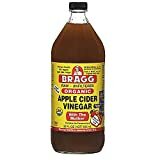 A common apple cider vinegar ear drop recipe involves combining an equal amount of ACV with distilled water, and mixing. About 10 drops are then placed in the dog's ear, and the ear is then gently massaged. As a supplement Apple Cider Vinegar is typically sold as a raw, unfiltered, unpasteurized drink. However Apple Cider Vinegar is also available in tablets and capsules.